Since I was a kid, I was always more fascinated with baseball’s “small stories”. While guys like The Babe and Hank Aaron have great stories, I gravitated towards the players you don’t find in the record books. For every Walter Johnson there were hundreds of players who toiled anonymously. Each one had a unique and often interesting story to tell. This is one of those “small stories”. Back during the teens and twenties, professional teams would schedule exhibition games against small town semi-pro teams to both generate revenue and scout young ball players. When the minor league Chattanooga Lookouts came to Middlesboro, Kentucky in 1920 to play the local nine, they expected an easy win. Unfortunately this small Kentucky town possessed a secret weapon named “Win”. Noble Winfred Ballou was a recent Eastern Kentucky University grad from Mount Morgan. By the time he pitched and beat Chattanooga that day, Win had earned a reputation as a pitcher for hire who lived up to his name. Like many other young ball players, each weekend Win Ballou suited up for a few different town or factory teams, a temporary superstar brought in to even the odds or settle once and for all a heated town rivalry. After Chattanooga’s loss, their manager tried his best to sign Ballou, but the pitcher’s friends convinced him to remain in Kentucky. Later that summer, Chattanooga’s manager secretly arranged for a town farther away to hire Ballou. Separated from his friends, the young pitcher was convinced to sign a professional contract. The Washington Senators brought Ballou up to the majors at the end of the 1925 season, and within weeks he was pitching in the World Series against the Pirates. 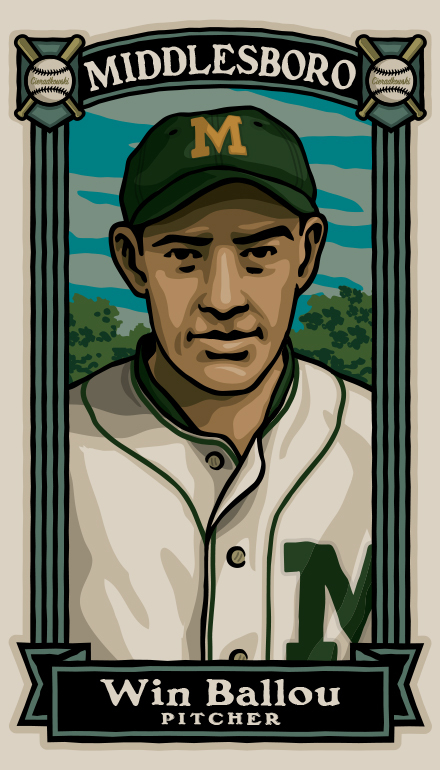 Ballou jumped around from the Senators to the Browns and finally the Dodgers before he was returned to the minors in 1930. Playing in the Pacific Coast League, Ballou found his niche as a relief pitcher, one of the first to perfect that role. A fan favorite and nicknamed “Old Pard” because of his age and reliability, Ballou pitched for the Los Angeles Angels and San Francisco Seals until he was 45. When Win Ballou passed away in 1963 he was admiringly eulogized in the West Coast newspapers as a beloved fixture of West Coast baseball. Ol’ Win Ballou didn’t set any records, nor did he leave any mark on the history of the game besides some forgotten box scores. Yet it’s guys like Win who make the history of the game fun. Imagine what he must have felt like – a kid reluctant to leave to hills of his native Kentucky and just a few years later pitching in a World Series! Sure it’s a small story, but it’s those small stories that combine to make up the greatest game ever invented. Gary Joseph Cieradkowski is the artist and writer behind The Infinite Baseball Card Set blog and the book “The League of Outsider Baseball: An Illustrated History of Baseball’s Forgotten Heroes“. He is also the 2015 recipient of the Tony Salin Award for contributions to baseball history. An award winning graphic artist and illustrator, chances are you have visited or bought something he designed: Bicycle Playing Cards, the music department of Barnes & Noble, the Folgers Coffee can, and the graphics for Oriole Park at Camden Yards, still regarded as the best designed ballpark in the Majors. Growing up a New York Mets fan in the 1970s, Gary learned to live with pain and disappointment until he married his beautiful wife Andrea. The two live happily in Northern Kentucky, unless they discuss the merits of the designated hitter rule. You can visit his blog at www.infinitecardset.blogspot.com. This entry was posted in Baseball, Blogathon, MiLB, MLB and tagged baseball, Blogathon, Cieradkowski, Gary Cieradkowski, Infinite Baseball Card Set, Win Ballou by danglickman. Bookmark the permalink.